Verdant countryside with different shades of green in the late summer sunshine. Contented cows grazing under shady trees. And in the hazy, distant horizon, spires of ancient cathedrals and medieval castles, waiting to be explored. 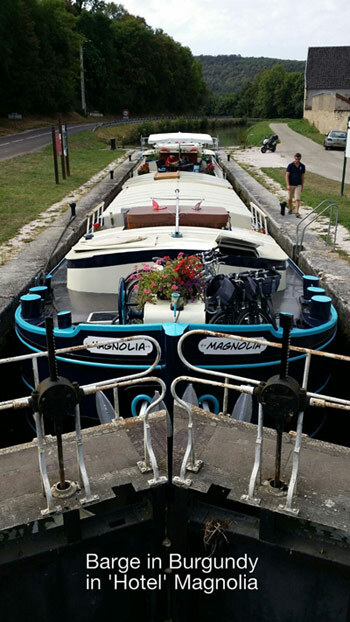 At the end of August, when the autumn chill has not set in, we stayed a week in a barge and explored Burgundy, cruising the canals when the Dukes ruled the fertile lands. The barge served as our home: 3 comfortable and clean bedrooms with attached toilets and bathrooms; a well-equipped kitchen with a gas-stove, oven, refrigerator and a dishwasher; dining room ; sitting room with CD players…and all these below deck. And most important – free wifi! My favourite place is on the deck. With a glass of iced cold juice, I would sit on the reclining chair and enjoy the views. Above me, blue skies with cottony clouds in the day and at night, millions of twinkling stars. On some days, after cycling along the tow path, we would put on our swim wear and sit in the jacuzzi, letting the water jets soothe our tired muscles. We enjoyed the experience of staying in a well-equipped barge with a crew who made sure that we were comfortable and safe. Let us introduce you to a novel and enjoyable way of experiencing the culture, produce and wines of Burgundy, France.